What’s the Story of Inclusive Competitiveness? According to census data, more than 31% of the U.S. population today is African American or Latino American with a projected growth to more than 46% of the population by 2060. Yet, less than 3.5% of GDP comes from these two demographic groups. How can America sustain leadership in global competitiveness with so much of her population producing so little? What if we took responsibility for raising awareness and empowering disconnected communities to work together by telling the emerging story of Inclusive Competitiveness? OUR PURPOSE for this evening’s conversation and collaboration is to connect people across sectors so that we all get a greater appreciation of related efforts occurring across the region. You may also come away with new relationships, new perceptions and an idea of your own next step. As part of Experience Engagement, a conference on journalism, community engagement, and impact, Journalism That Matters and the Agora Journalism Center, are hosting this community conversation to highlight a topic vital to Portland’s future. 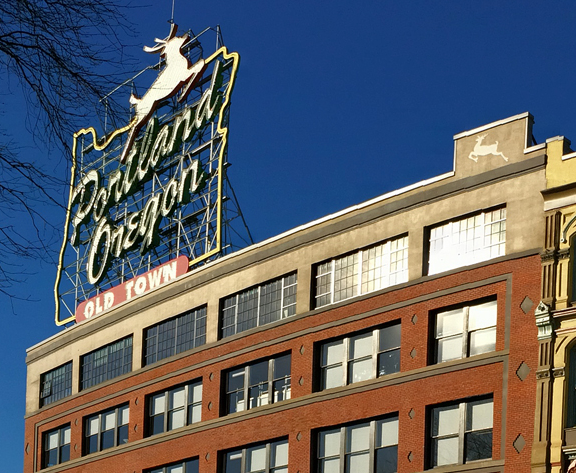 This highly interactive session will bring a diverse cross section of Portland residents involved in the innovation economy together with conference attendees — journalists and other community storytellers from around the country. Stories told from across the spectrum of the innovation ecosystem — education, workforce development, entrepreneurship, funding, and policymaking — that bring about shared vision, strategy and a framework with measurable goals to improve the productivity performance of underrepresented populations to grow new jobs and benefit the national economy. Underrepresented populations — racial minorities, women, rural residents — connected to education, resources, and support to effectively cultivate their hidden talent and value. Public support for policies that equip entrepreneurs from all backgrounds to contribute to the prolific growth of innovation ecosystems and fast-paced industries that improve the economy. Inclusion and economic well-being of, by, and for us all. Registration is free, but space is limited. So please register soon. join us to jump start a conversation to bring these aspirations to life in Portland — and beyond. If you are in education K-12 and higher education, workforce development, small business development, economic development and urban planning, community foundations, local corporate entities, NGOs or someone concerned about Portland’s future… Register today! 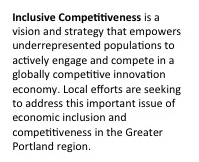 The bulk of our time together will involve a lively exchange intended to bring to life the story of Inclusive Competitiveness in Portland. We will envision how it manifests across community sectors individually and collectively today and in the future. We’ll be using the World Cafe, which creates a living network of connected small-group conversations focused on shared “questions that matter” in order to foster the emergence of collective intelligence and committed action. This evening is made possible through a gift from our sponsor. This Friday evening community event is a part of a larger gathering, Experience Engagement, Oct 1-4, which brings together the best practitioners on the leading edge of engaging with communities to learn from one another. So if you’re registered for Experience Engagement, you don’t need to register separately for this evening’s conversation.